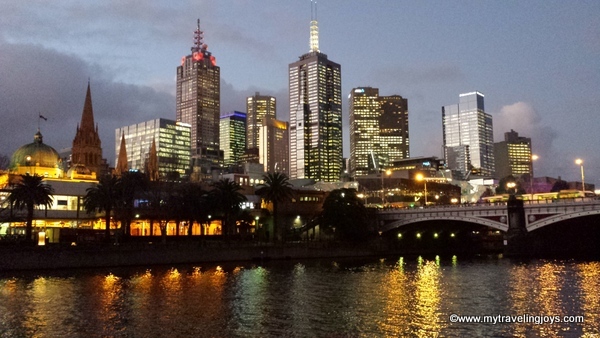 I think I spent my first week in Melbourne overwhelmed and consumed by extreme jetlag, English-language overload and a burgeoning foodie scene. From Warsaw, I had a 26-hour flight that took me through Dubai and Kuala Lumpur before landing in Melbourne at 1 a.m. on a Saturday. I was exhausted, confused and didn’t even know what day it was, technically. I left on a Thursday and landed on a Saturday as if I had been in some kind of time warp. This was the longest flight I’d ever been on, my muscles ached and all I wanted to do was sleep. 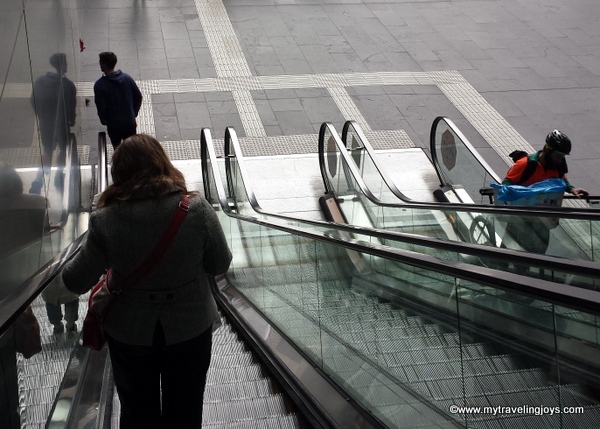 Since I’ve had a little time to adjust and reflect, I thought I would share my ups and downs from my first week here in expat country number three. I often find myself messaging my good Melburnian girlfriend I met in Warsaw who’s now living in Dubai and telling her about my day here. So far the Australians I’ve encountered at cafés, restaurants and stores seem super friendly to me! 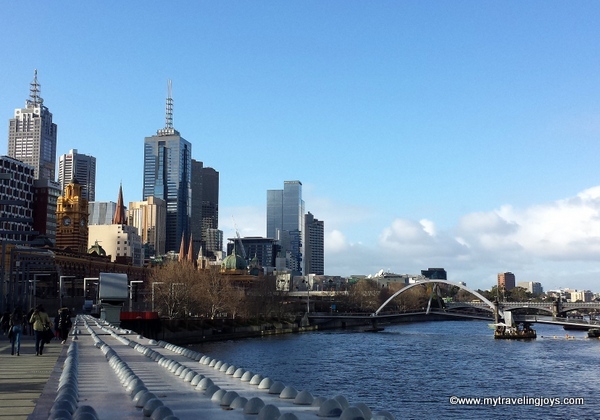 One of the rare, really sunny days during winter in Melbourne along the Yarra River. Besides suffering jet lag and waking up every day at 3 a.m. wide awake, I’ve been dealing with different seasons and a major time difference. While all my friends in Europe and the U.S. are posting sunny beach and mouthwatering BBQ photos, I’m dealing with fall-like temperatures (5-10C/41-50F) and chilly, dreary, rainy days. I’m wearing winter hats, scarves and gloves. Our apartment never seems to warm up so I sit in front of an electric heater every day when I’m on the computer. 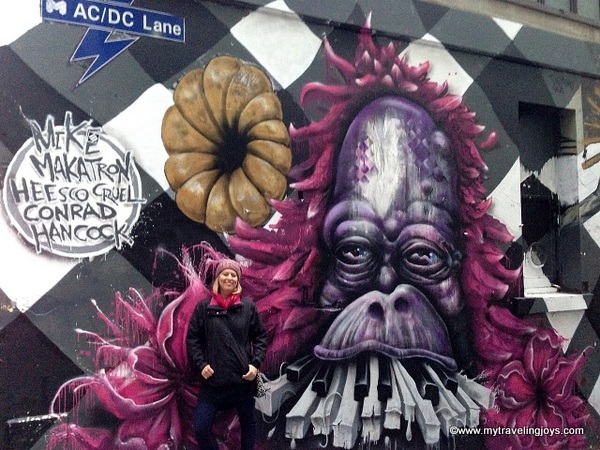 Staying bundled up while exploring Melbourne's awesome street art scene. Although we’ve had several partly sunny days, we’re living in the middle of winter down under. At least, there’s no snow! Well, at least not in the city. Being so far in another part of the world also means a crazy time difference. That means 6 hours to Dubai, 8 hours to Warsaw and 15 hours to my family in the U.S. Thank goodness my phone’s weather app keeps track of the various times for me! My mom still has a hard time understanding that I’m a full day ahead of her when I call in the morning my time, but early evening for them. So much of Melbourne reminds me of a smaller version of NYC. The city is located along a river. The taxis are yellow. There’s a theater district just like in Times Square, and the CBD’s architecture is reminiscent of buildings built in the early 1900s in NY. The food and market scene is amazing! 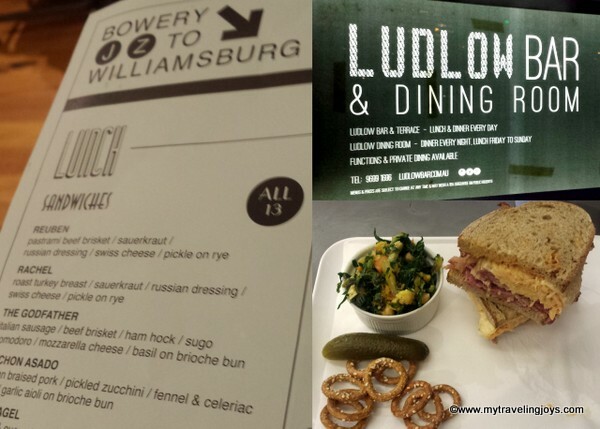 Plus, there are even restaurants named after places in New York. Perhaps all these almost familiar items are why I feel so comfortable in Melbourne. Now, all I need to do is find a good Mexican restaurant and I’m set as an expat. Traffic flows in the opposite direction here compared to what I’m used to in Europe and the U.S. Australians drive on the left side of the road just like their counterparts in the U.K. Trams and buses follow the same route. I have to make sure I look twice before crossing the street. I have to always remind myself that if I want to go north, I need to catch the tram on the west side of the street and so forth. Afternoon traffic in Melbourne's Southbank neighborhood where we live. At first, these rules were very confusing, but I think I’m finally starting to get the hang of opposite world and hopefully I’ll never get fined for walking the wrong way. 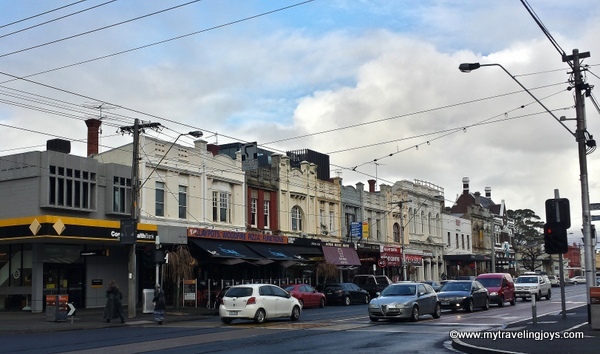 During my first week living in Melbourne, I ate American barbecue, Australian kangaroo, Chinese dumplings, Italian cannolis, Korean ramen noodles, Vietnamese pho noodle soup and Turkish breakfast, gözleme and lamb pide. I am literally in foodie heaven here! 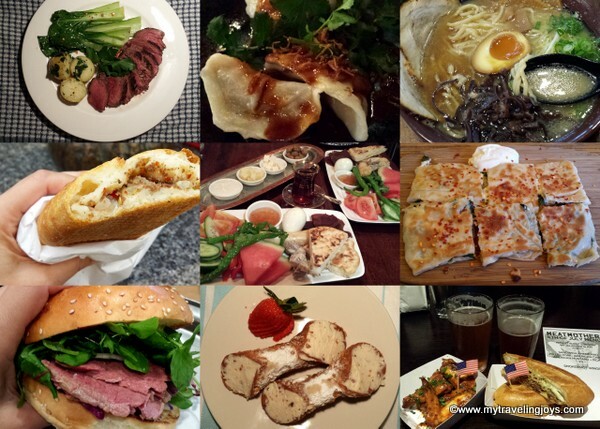 I can get every kind of cuisine that I want, and I plan to try it all! 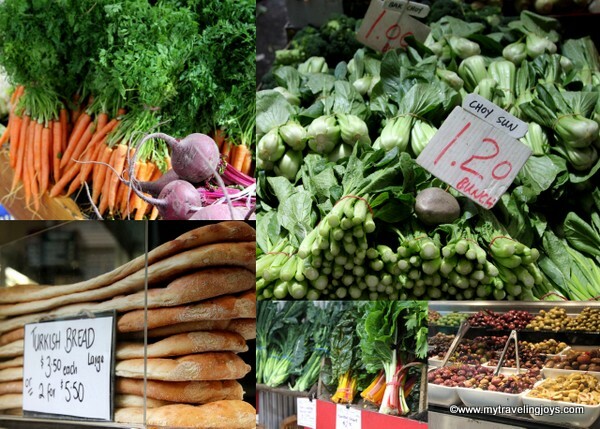 I've also visited and been impressed with the farmer's markets here - Queen Victoria Market and South Melbourne Market - so far. I knew my Australian friends loved coffee, but to see this fact in person down under is a whole different thing. There are coffee shops everywhere! And a flat white, seems to be the popular Aussie order. This caffeinated beverage was created here in Australia or New Zealand, both countries lay claim to its invention. A flat white is an espresso-based beverage with steamed milk consisting of very small, fine bubbles (micro-foam) resulting in a velvety consistency. There’s no distinct layer between the coffee and foam. A flat white is not just a small latté because there’s a higher proportion of coffee to milk and the foam is different. All that I’ve learned so far is that a flat white is delicious and often pretty! 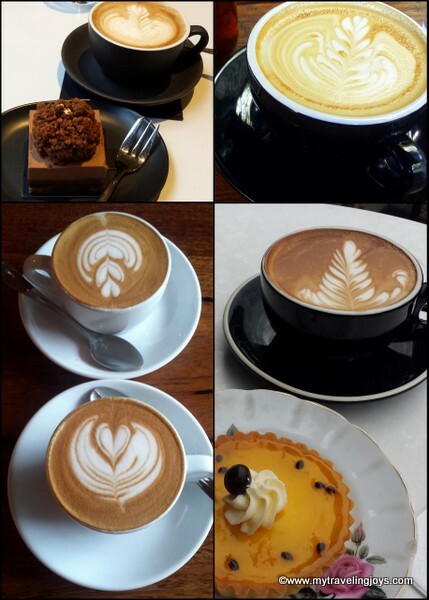 An Aussie flat white is best enjoyed with dessert in my opinion. It’s been nearly 3 weeks now since I joined my husband here in Melbourne. I’m over the jetlag and just trying to explore the city as much as I can. I hope you’ll stay tuned for more of my Australian adventures! I'm surprise you had time to post this with ALL THE EATING!! Keep me posted on your trip to Sydney. Give my friend there a call! how exciting! do you know how long you will be there? i always get jet lag and i hate it! What a fantastic opportunity to see the other side of the world. Your memoirs are going to be a great read. Hi Joyce! Not sure yet. Definitely a few months...probably til September or October. I'm feeling better now at least. Have you seen Chef's Table on Netflix? One chef that was featured is based in Melbourne -- his restaurant is called Attica. If you ever go, please let me know so I can live vicariously through you! It seems like you're having a blast in your new home -- Instagram photos are gorgeous! I think that is one of the first things I said when I first saw the Melbourne CBD, "It reminds me of a smaller NYC!" After living here for more than a year, I think I enjoy Melbourne much better than I ever did NYC. People are friendlier, there is always something to do, and the food here is AMAZING! I would like to check out the restaurants.